The need to contain rising healthcare costs is driving payers to adopt new models of reimbursement, such as value-based pricing. Advanced diagnostic testing, particularly with respect to therapies where the test result determines whether or not the therapy should be used (precision medicine) can potentially reduce costly inefficiencies in medicine by ensuring the right patient gets the right therapy, at the right time. However, there are a number of barriers to efficient testing which must be addressed in order to achieve this promise. This article identifies a number of potential barriers to effective commercialization of advanced diagnostic testing in the context of precision medicine and uses modelling to estimate the economic and personal costs such barriers impose on the healthcare system. Modelling suggests that nearly 80,000 patients per year in the US alone are lost to the benefits of precision therapies, at a cost not only to the pharma industry of in excess of $8Bn, but also to the patients in the form of inadequate medical care. Payers are applying pressure for value-based pricing of pharmaceutical therapies and are already moving toward a pay-by-result model. They recognize that a significant percentage of drug treatments fail to achieve desired outcomes and are therefore trying to identify and reimburse for therapies that produce positive outcomes in patients while refraining from paying for those that fail. Advanced diagnostic testing offers both the insurance and pharma industries a long-term solution and a way forward. This article identifies stakeholder concerns over value-based pricing of pharmaceutical therapies, the promise and potential of diagnostic testing in precision medicine, and the roadblocks and barriers that sometimes plague the diagnostic testing process. It also presents recommendations for how stakeholders can work together to maximize the value of diagnostic testing for providers, payers, consumers, suppliers, government and other vital stakeholders across the continuum of care, most importantly patients. Government price-crunching: Stakeholders may confront changes to the Medicaid best-price rule, where value varies depending on the indication. In the case of a low-value indication, Medicaid insists on a lower price; in the case of a high-value indication, the drug may be overpriced. Other payers tend to follow Medicaid in a drive to bring down costs. Sky-high investments: As healthcare costs continue to escalate, pharma companies largely foot the bill for investment in new therapies. At the same time, both payers and pharma companies are eager to extract higher value from healthcare—specifically from high-cost therapies that produce positive outcomes in patients. But pharma, which can invest $1 - 5 billion to develop and launch a new drug, must recoup its initial investment by pricing a drug to turn a profit, reinvest in innovation and cover the costs of those assets that fail prior to regulatory approval. Private payers aim to keep costs down to sustain profitability, while government payers must avoid added tax burdens. International interests: The majority of pharma companies are multinationals concerned about marketing their products in a number of countries other than the US. Pricing deals struck between reimbursement agencies in non-US countries have prompted the U.S. administration to push for pricing that prevents what it views as U.S. consumer subsidization of drugs in other nations. Pharma must achieve a balance between deals made in other countries and prevailing trends within the U.S.
Association push-back: Associations like the American Society of Clinical Oncology (ASCO) and the American Medical Association (AMA) are likely to push back against allowing strict economic calculations to dictate the practice of medicine. Physicians and other providers will resist if payers insist on limiting reimbursement to less effective drugs that physicians would typically refrain from prescribing to their patients. This thinking is reflected in the Affordable Care Act (ACA), which prohibits the use of outcome calculations such as QALYs to set payment thresholds. Engaged patients: Increasingly aware of breakthrough trends like liquid biopsies and genetic sequencing, more savvy patients and consumers need and want diagnostic testing and treatment. Now, however, they face escalating premiums, co-pays, and deductibles and worries over which tests and treatment their health plans will cover. To move forward on value-based pricing, stakeholders, including pharma, consumers, payers, providers, researchers, labs and suppliers, must reach consensus on a definition of value and evaluate if therapies can and do achieve that value. They must decide which tests to make available to providers and consumers, and the level of performance required of these tests. Looming large over stakeholder concerns is lackluster transparency. Transparency in pharma is lacking throughout the continuum that begins with manufacturers, employers, and payers and extends through PBMs, patients and consumers. Consumers, for example, neither know nor understand the rationale behind the prices of specific drugs. Instead, they reach out to a drug supply chain, fill their prescriptions and submit required co-pays. Large health plans like United Healthcare, Anthem, Aetna or Cigna could negotiate prices with manufacturers, which would give members access to these therapies at lower prices. But most plans refrain from sharing such information with competing health plans and drug manufacturers. Therefore, the ultimate buyers—employers, patients and consumers—never learn the actual prices. Instead, they rely on plans and PBMs to manage pharmacy benefits. Transparency is absent because no entity wants competitors to identify revenue breakdown. However, transparency may accelerate. Unfortunately, change rarely comes from within an industry. Instead new entrants with highly disruptive business models enter a market. They take business away from traditional enterprises and force them to adapt, much like online travel web sites replaced travel agents and online shopping attacks brick and mortar stores. A second scenario driving enhanced transparency and value-based pricing is advanced diagnostics. Precision medicine provides an alternative to traditional, “one-size-fits-all” prescribing. Instead, advanced diagnostics aims to deliver the right treatment to the right patient at the right time, zeroing in on those patients who will likely benefit from a particular therapy. Diagnostic testing comes with some good news and bad news. The downside of diagnostic testing is that drug prices may climb higher. The multi-billion dollar investment required to develop and market a blockbuster drug was once spread over millions of patients. Now, however, diagnostic testing will identify appropriate drugs for smaller, more highly targeted groups of patients. While diagnostic testing delivers access to more patients, it may pinpoint fewer patients who will benefit from a given therapy. On the other hand, the use of diagnostic testing in clinical trials could foster smaller, faster and less costly trials—either by zeroing in on responder patients or broadening a trial’s scope. And diagnostic testing comes with new hope for patients with rare diseases as researchers seek effective treatments where none exist. Step Therapy: Diagnostic testing supports a way to avoid step therapy, often called “fail first therapy” by its detractors. Rather than waiting to see if a particular therapy is having the intended effect on a patient, quality diagnostic testing can identify the likely responders up front. This avoids unnecessary expenses related to administering a therapy that will likely fail to work. It also curtails the added strain put on a patient whose health is already compromised by the condition being treated. Adverse Reaction Spotting: Testing can help determine a patient’s risk for having an adverse event (AE). If the patient is a likely non-responder, testing can prevent the patient from being exposed to the risks of an AE without receiving the benefits of treatment. If clinicians can determine if a patient could or will have an adverse reaction to a drug, they can save both on the costs of administering the drug and dealing with its side effects. If testing is unable to determine whether a drug will work or not, clinicians may be able to claim that the drug will precipitate an adverse event that could lead to a costly hospitalization. Diagnostic testing can also support physicians in understanding how a patient metabolizes drugs, which may determine how a patient responds to a specific drug. Clinicians can modify the dose of a drug given to a patient according to how the patient will likely metabolize the drug (or metabolize a pro-drug to an active form). This ensures that the dose is safe and effective. For example, a clinician could recommend evaluating a patient’s response to the antiplatelet drug clopidogrel (Plavix) by detecting variations in the CYP2C19 gene, which indicates how a patient will metabolize the drug. Accelerated Treatment: Diagnostic testing also informs physicians in rapid-response patient treatment. The earlier clinicians can diagnose patients, the more effective a therapy may be. Armed with the results of diagnostic testing, physicians could treat breast cancer in its earliest stages rather than in stages three or four. Also, they could not prescribe drugs that are unlikely to work in the patient, but which could potentially have adverse side effects that threaten patient safety. The model emerged from a collaborative process facilitated by the Personalized Medicine (PM) Connective through a series of workshops and surveys. Among the model’s focus areas are clinical practice and operational, diagnostics, pharmaceuticals, reimbursement, regulatory, and guidelines and education. Each focus area is supported with a series of near-term, medium-term and longer term goals, including improved clinical collaboration, new options of melanoma adjuvant therapy, consideration of clinical trials as a standard of care, and measurement of combination therapy versus monotherapy. Also unique to the model is its analysis of the unique features of melanoma, which is typically discovered via inspection by the patient or a physician who classifies the melanoma and performs further diagnostics to identify effective therapies. Among the therapies is immunotherapy, which earned significant media coverage when former President Jimmy Carter was effectively treated with pembrolizumab (Merck’s PD-L1 inhibitor Keytruda®). Unfortunately, immunotherapy may work in only 20 to 25 percent of melanoma patients whose cancer expresses the protein PD-L1. This offers diagnostic testing the opportunity to determine if immunotherapy or more traditional therapies are likely to generate more positive outcomes. The nature of cancer, including melanoma, reveals the vast potential of diagnostic testing. Cancer is heterogeneous, not homogenous. A solid tumor biopsy may not represent an entire cancer. Some cancer may mutate, meaning that even if a therapy is initially effective, it may not be effective for an extended period of time. A clinician may have removed only some components of a cancer during a biopsy while missing others. And cancer can interfere with the effective functioning of the immune system. Immunotherapy can turn the immune system back on without being able to turn it off, which could cause the immune system to attack healthy cells in a phenomenon known as a cytokine-storm. We are also seeing an evolution for diagnostic testing. In May 2017, the Food and Drug Administration (FDA) approved pembrolizumab for use against tumors that share a specific genetic profile. Rather than strictly basing effectiveness on the location in the body where the tumor may have originated, i.e. lung or breast, the indication is based on whether the tumors express a biomarker referred to as microsatellite instability (MSI-H) or mismatch repair deficient (dMMR). This development allows physicians to treat a number of different cancers based on a single diagnostic test result. Location where the test is performed e.g. central lab, doctor’s office, patient’s bedside, patient’s home. Physician knowledge and awareness: Physicians order diagnostic tests. However, if physicians never learn about or understand the rationale, value and availability of a diagnostic test, or if they assume that payers will refuse to cover the test, they may refrain from ordering it. Questions about test quality: Physicians may be unconvinced of the quality of test results. Labs may lose samples or ask for larger samples. 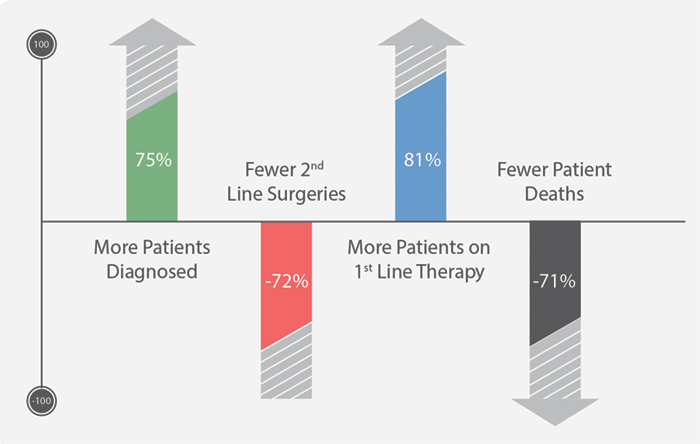 Two- to-five percent of lab results are returned with the notation QNS, meaning “quantity not sufficient.” This translates into a demand for retesting and putting the patient through another biopsy. Sample availability: Physicians may not be willing to bring a patient in for a second biopsy. Instead physicians will weigh the advantages of a first, second or even third biopsy against the disadvantages of putting a patient through added discomfort and inconvenience. A biopsy also heightens the risk of tumor cells spreading to other locations, so physicians may be hesitant in some instances to perform multiple biopsies. Test availability: The majority of labs are concentrated in large urban centers. However, test availability also depends on the test’s technical features. While a simple stain of tissue is widely available across the U.S., more esoteric next-generation sequencing-based tests may only be available in only one lab. For example, the CCR4 test for Maraviroc has a turnaround time of about 12 weeks. If physicians want a test called OncotypeDX they must send a sample to a single lab and wait for results by fax or e-mail. Test turnaround time: Labs with exclusives on tests can apply economies of scale and ensure test quality. However, they sometimes struggle with bottlenecks that delay test results and treatment decision making. If a clinician needs to treat a patient within three-to-four days, but gets results back in 13 days, the patient will suffer the consequences. For example, patients with Acute Myeloid Leukemia (AML) are often gravely ill. If a physician has to wait more than 72 hours for a test result, the patient’s life may be at risk, so treatment decisions may have to be made in the absence of an important diagnostic result that could indicate which treatment may be most effective. In some cases, clinicians never use a treatment—or don’t use a treatment quickly enough—due to problems in lab turnaround times. Test complexity: A growing number of companies offer test/algorithm combinations that involve examination of a 350-to-500 gene signature and application of a proprietary algorithm to interpret the patient’s prognosis or outcomes of treatment. The algorithm becomes as important as the test because it mines evidence-based insights out of the data. However, the complexity of the test may lengthen turnaround times. Reporting complexity: A related issue is reporting complexity. Complex results on multi-gene signatures may lead physicians to misunderstand what the test results mean, preventing them from properly interpreting, analyzing, and acting upon diagnostic test results. Some labs perform large-scale genomic analysis with complex algorithms. However, lab reports sometimes fail to provide adequate guidance and actionable information on which therapies physicians should prescribe. Interpretation of results is often left to the physician, which may be confusing. Some labs that do PD-L1 testing only perform the technical component while leaving the professional component of interpretation to the ordering physician. With a number of different assays available, and differences in indications and cutoff points for the various PD-L1 therapies, just getting a result may not be enough to make the correct decision for a particular patient. Reimbursement: While reimbursement for diagnostic testing exists, it may be insufficient and will vary by test. In the case of more routine diagnostic tests like surgical pathology or immunohistochemistry, CPT codes are in place and reimbursement is a routine process. However, with some mid-scale genetic tests like BRAF and genetic mutation, the payer requests pre-authorization. The lab must ask the payer to determine the appropriateness of the test given the patient’s diagnostic codes. Reimbursement challenges every stakeholder. New diagnostic tests may not be reimbursed for 18 months-to-two years, while payers deem other tests “investigational” and “not medically necessary.” If a payer denies reimbursement, and the physician fails to make a case for the test, the bill is left with the patient. And while pharmaceutical companies pay for a drug, depending on the market, they may not be able to subsidize a test. Several actions promise to unblock the potential of diagnostic testing and address stakeholder interests, including increased clinician demand for testing, test expansion with improved quality, more predictable reimbursement, and greater transparency around test ordering and reporting of results. Ultimately, insights on the clinical and business performance of a therapy may surface as one component of a diagnostic test ordered by a clinician. While payers may prefer to postpone or restrict payment, diagnostic testing data from multiple sources will help ensure patients get the best treatment available. Publication of testing data from multiple sources, including clinical trials and real-world studies, will raise awareness of how and where clinicians should use a test, which will, in turn, drive demand for testing. Promote the clinical and business performance of diagnostic testing via research and education. This step includes the design and implementation of prospective research and cost effectiveness studies through research partnerships and the dissemination of results both with payers, and with health care providers who shape demand for quality diagnostic testing. Education programs can help clarify the processes of test ordering while serving as a platform to discuss the rationale, features, functions, benefits and results of existing and emerging diagnostic tests. Support labs via technology, standards and guidelines: While companion and complementary diagnostics have moved forward considerably to support the significant wave of precision medicine therapies, enabling physicians, payers, labs and patients to reap considerable benefits, more work can be done. Labs and lab-related associations need expertise to design standardized procedures that will overcome the testing concerns outlined in this article—from tissue management and turnaround times, to test quality and results reporting. They also need support to select and implement technologies that will overcome time-consuming and costly tech hurdles. Labs also need guidance in making data more useful to physicians, payers, consumers and other stakeholders. Interpretation of test results coming from the lab to the physician must be clear enough for clinicians to take effective action by treating or not treating a patient with a certain drug. Interpretation must also be clear enough for payers to understand what they are covering and reimbursing for the benefit of the patient. Going forward, diagnostic testing will continue to move therapy from one-size-fits-all to truly personalized medicine. Results will vary by patient, condition and therapy. Testing will determine both the course of treatment, likely outcomes and potential risk of adverse events. The goal is to create a data-driven balance that maximizes the benefits of diagnostic testing and treatment for all stakeholders—most importantly, the patients. Dave Smart is a biochemist with a PhD in neurochemistry and over 24 years of experience in the design, development, manufacture and commercialisation of diagnostics. He has worked extensively on modelling the impact of diagnostics on therapy in a variety of conditions and currently works as a Director for Diaceutics, specialising in the acquisition, analysis and understanding of diagnostic data as it relates to therapy utilisation and the patient journey. Steve Vitale is an MBA with 20 years of experience in marketing throughout the pharmaceutical industry. He has lead commercialization efforts for a variety of new products and indications across multiple disease areas. As a Managing Director at Diaceutics, Steve has driven activity to help transform the industry model by enabling pharmaceutical companies to effectively commercialize and integrate diagnostic testing with targeted therapies, radically improving patient outcomes. Jeff Waldron, MBA, has over 25 years of healthcare experience, working cross functionally in strategic, financial and operational capacities. He has developed expertise in reimbursement and access, while working to identify and resolve the potential barriers patients face. As Executive Director of the non-profit PM Connective, Jeff worked to better integrate the precision medicine business model across all stakeholders. 4 McLachlan, CYL, Yu, M, Ling, A, Jardine, JL. Adverse Drug Events Are a Major Cause of Acute Medical Admission. Internal Medicine Journal. 7, July 2014 (Available from http://onlinelibrary.wiley.com/doi/10.1111/imj.12455/abstract). 10 Diaceutics. A New International Collaborative Has Been Formed to Help Remove Barriers Limiting the Promise of Precision Medicine. 7, August 2016. New York, New York (Available from: https://www.diaceutics.com/a-new-international-collaborative-has-been-formed-to-help-remove-barriers-limiting-the-promise-of-personalizedprecision-medicine).